UP's skipper Vinesh Phogat then made it two in two, with a dominating 10-0 in the 50kg women's event win against compatriot Seema. Belarus' Vanesa Kaladzinskaya overcame Nigeria's Odunayo Folasade to guide UP Dangal to their second successive victory in the Pro Wrestling League here at the Siri Fort Indoor Stadium on Saturday. Vanesa began slowly, allowing Odunayo of Mumbai Maharathi to steal the early initiative. She, however, came into her own as the bout progressed and eventually won 7-5 in the 57 kg competition. At one stage, she was on the brink of defeat but she held on to her nerve to give her side an unassailable 4-2 lead in the tie. Asian Champion Abdurakhmonov Bekzod set up the victory, after the two were tied 2-2, scripting a crucial victory over India's Veer Dev in 74 kg event to put UP in the driving seat after the fifth bout. The Uzbek wrestler made a meal out of his opponent, injuring him smartly and completing the rout 12-0 with over three minutes left in the bout. In the inconsequential seventh bout, Rio Olympic gold medalist Soslan Romonov beat Bajrang Punia to register his side's third point but lost 3-4 on the night. In the lung-opener, last tie's hero for UP Dangal, Nitin, continued his marvellous run to score the biggest upset of the tournament so far. He downed the World Championship bronze medalist Yatsenko Andrey 4-3 in the 57 kg competition for his team's first point. Nitin nosed ahead in the opening period with a solitary point. 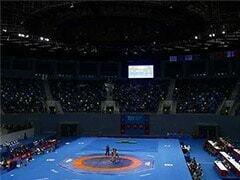 The Azerbaijan wrestler, however, bounced back and won four points to turn the tide. Just as it all seemed over for himself, Nitin cliched a three-pointer in the dying seconds to clinch a dramatic win. The 2017 Commonwealth Wrestling Champion was completely ruthless on the mat, never allowing her opponent any chance. She cruised home to help UP seize the early initiative. 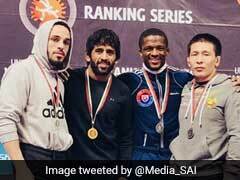 The Maharathis, however, came back into the contest, with 2014 Commonwealth Games' silver medalist Satyawart Kadian defeating UP's Vicky 10-2 in the 92 kg contest. 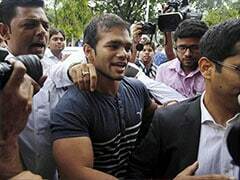 The burly Satyawart, who had made a disappointing start to his campaign, bounced back in style. He dominated the six-minute bout to help his side stay in the bout . Maharathis' icon player Sakshi Malik levelled the tie 2-2, toying with young Reshma Mane who came in last-minute replacement for Geeta Phogat. Sakshi proved to be a handful, as she tamed Mane 16-0 in the 62 kg women's event.